Basket side yoke & Vbraid, made with Herman Oak 6-7 ounce tooling strap, hand dyed, hand antiqued, and hand laquered. 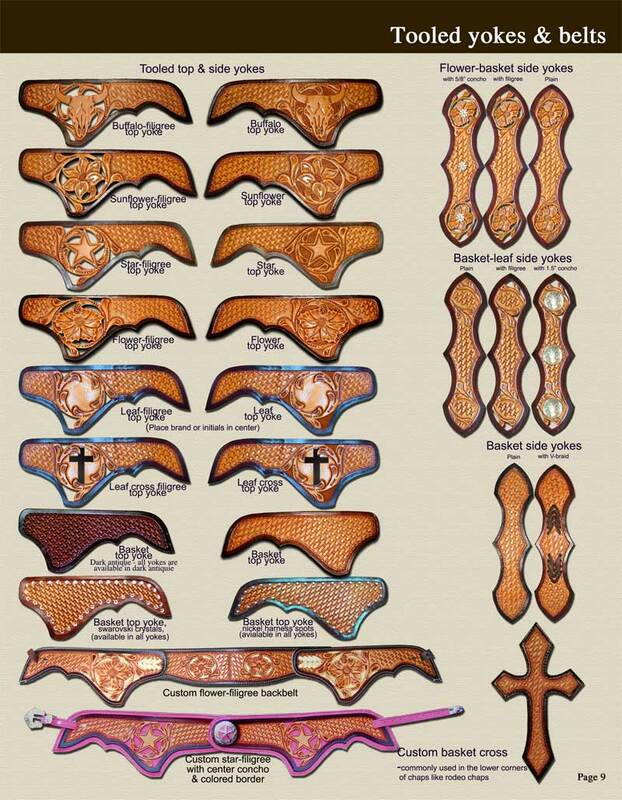 The v-braid option shown here can be made with various colors of leather to match your chaps, metallic leather, or rawhide. The v-braid color shown in the picture is chocolate leather. and hand laquered. This side yoke is designed for use with 1.5" diameter conchos. Basket leaf side yoke, hand tooled with Herman Oak 6-7 ounce tooling strap, hand dyed, hand antiqued, and hand laquered. Basket side yoke, made with Herman Oak 6-7 ounce tooling strap, hand dyed, hand antiqued, and hand laquered. additional charge for those chaps with buckle legs. Basket top yoke, made with Herman Oak 6-7 ounce tooling strap, hand dyed, hand antiqued, and hand laquered. Buffalo top yoke, hand tooled with Herman Oak 6-7 ounce tooling strap, hand dyed, hand antiqued, and hand laquered. Flower filigree top yoke, hand tooled with Herman Oak 6-7 ounce tooling strap, hand dyed, hand antiqued, and hand laquered. Sunflower-filigree top yoke, hand tooled with Herman Oak 6-7 ounce tooling strap, hand dyed, hand antiqued, and handlaquered. Sunflower top yoke, hand tooled with Herman Oak 6-7 ounce tooling strap, hand dyed, hand antiqued, and hand laquered.